The tin whistle is a small fipple flute or flageolet, and like the bodhran, exists in many forms in many different cultures. What is uniquely Irish is the playing and musical style, again like the bodhran. The whistle is one of the most popular Irish instruments, as it is small, cheap and durable, and can be easily obtained in music shops. It is often used for beginners as an introduction to the world of Irish traditional music, and is a popular school instrument. Although it is a small, simple instrument, it can be and is played to a virtuoso level – for example players like Mary Bergin, Donncha O’Briain or Paddy Moloney. The whistle was first used in Irish traditional music in the early 19th century, although similar instruments seem to have been used much earlier – bone flutes were discovered on the site of the old Viking settlement of Dublin. It was with mass production during the Industrial revolution that the whistle gained in popularity, becoming more easily accessible and cheaper. The Clarke whistle, first made in 1843, was the first of the mass-produced whistles. Clarke whistles, first made before the use of plastic, consist of a single tin plate rolled into a conical shape, with a wooden plug forming the windway. The basic whistle design is increasingly being modified and modernised, as players seek a louder, more powerful sound and a rounder, more developed tone. Whistles are now made in many alloys such as aluminium, in plastic or wood. 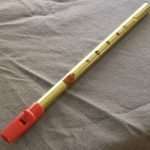 The basic system of a six-holed fipple flute remains the same. The holes are covered by the first three fingers of each hand. The scale is played by lifting a finger each time. The higher octave is produced by blowing slightly harder. 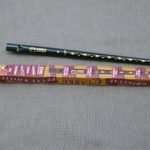 The D tin whistle is the standard in Irish music, and can play easily in the keys of D and G, and their relative minors and modes, which means it covers the vast majority of Irish traditional music. Ornamentation on the whistle is derived from Uilleann Pipe ornamentation. Cuts, rolls, taps, slides and crans are played. More information on ornamentation. 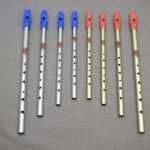 This entry was posted in About Irish Music and tagged Tin Whistle, Tin Whistle Tunes.